So here is Part Two of my double coverage of Microsoft’s Windows 10 event that just happened. If you haven’t read Part One then you missed out on information about what Windows 10 is bringing to the table for desktop users. This article is going to focus on the mobile and touchscreen aspects coming with the new operating system. SEE: Windows 10 Preview; Featuring Project Spartan, Cortana, HoloLens and More! So first let’s take a look at the brand new suite of Office apps that Microsoft unveiled with Windows 10. Joe Belifore displayed a preview version of Word, Excel and PowerPoint apps designed for mobile users of Windows 10 and for Windows Phone. What’s great about this is that all of the new Office apps will be free and automatically included with the Windows 10 build on smartphones; so you’ll already have them. In addition to that, the latest versions of these apps also support the Office Ribbon. This allows you to quickly access the formatting menu at any time, creating what Belifore stated was a “nearly no compromise experience” when using these apps on Windows Phone. 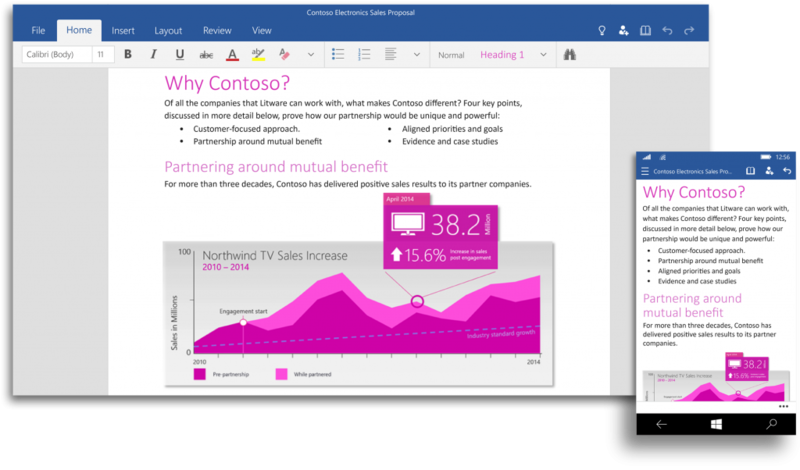 The new Office apps will also support wireless printing and mirrocast, allowing you to beam presentations to a display from your phone or tablet. Belifore also showed off the upcoming Outlook email and Calendar apps for Windows 10, which will be universal. 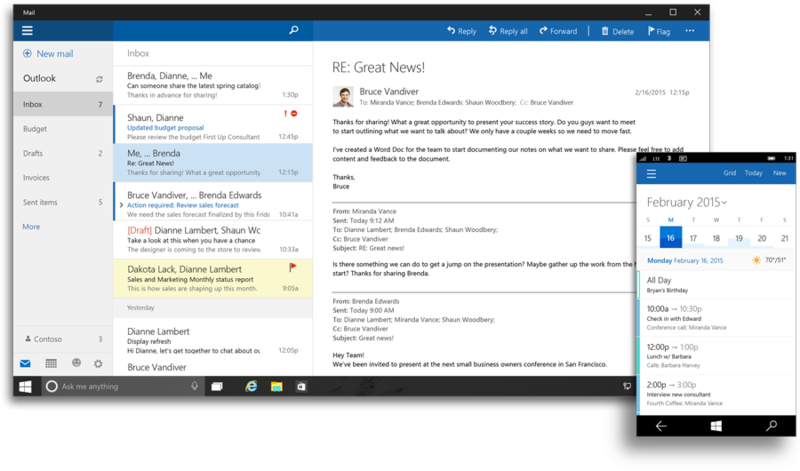 The new Outlook will include gesture support, with things like swiping left or right allowing you to delete or flag messages in your inbox. All of these new apps look different from the current ones and the new user experience is more akin to the current apps on the desktop, which isn’t necessarily a bad thing, and the fact that they are all being offered for free is definitely a nice incentive. 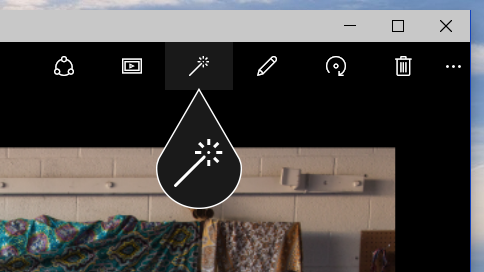 In addition to universal Office apps, Microsoft also unveiled its new universal Photos app that you will be able to use on your Windows phone, tablet or PC. Based on what was seen at the presentation, this app seems to be focused on delivering organization and visuals to make browsing your photos and distributing them as easy as possible, especially for mobile users. 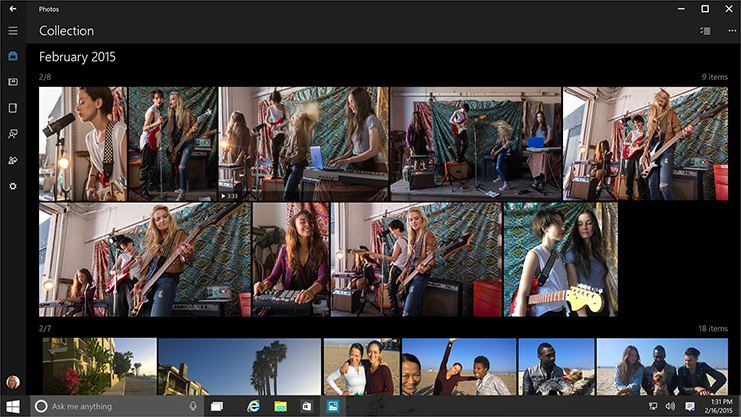 In terms of organization, the new Photos app aggregates all of your photos on both your device and your OneDrive and gives you a Collection view. This Collection view sorts out photos that may have been taken during burst mode in addition to those that are accidental duplications. You can also choose to let the app create auto-generated photo albums of all of your pictures on your device or OneDrive or create your own. Regardless, the visual effect is pretty nice and there’s an interesting “hero view” that automatically places a photo at the top of your albums. Moreover, photos can also be auto-enhanced, which happens in the cloud. This allows you to remove red eye and brighten dark photos with one simple command. However, where the presentation really took off is when the app experience for the desktop was shown off. The desktop experience looked nearly identical to the mobile version, which shows that Microsoft is truly attempting to offer a universal app experience and that their efforts are succeeding. The worst part is that the Photos app won’t be available in the initial Windows 10 release, though a release is planned for the future. Microsoft’s juggernaut gaming console, the Xbox (specifically the Xbox One) is also getting the Windows 10 treatment. Phil Spencer, who is the head of Microsoft’s Xbox division, introduced a ton of gaming and entertainment options for Windows 10. Windows 10 users who are also Xbox users will be able to share things like Game DVR and being able to voice chat or text your Xbox friends over the Xbox Live app in addition to the ability to stream any Xbox One game to any Windows 10 PC or tablet within your home. In a question to the crown Spencer asked, “Wouldn’t it be great if you could play games from anywhere in the house?” Xbox One gamers will be able to play their entire library of games (at least the ones installed to the hard drive) from any Windows 10 PC or tablet as long as you are in the same house. You can also turn off the console via the Xbox Live app on mobile devices as well. Spencer added that Windows 10 will also be coming to Xbox One. “For developers that want to bring their application to the television screen, this is going to make it very easy for them to do so,” Spencer noted. Probably the best thing Spencer debuted was the fact that Windows 10 PC users will able to “cross-play” games with Xbox One users, a first in the gaming community. Finally, Microsoft also unveiled the Surface Hub, the biggest product to date from the company. The Microsoft Surface Hub is an 84″ 4K display designed for the workplace. It can be mounted on a wall and used as a visualization tool during meetings or brainstorming sessions. The Surface Hub has a ton of built-in sensors, cameras, NFC and microphones and (this is the real kicker) it only requires one cable to get started. From the Welcome screen, users will be able to call or connect to a personal device to bring content to the screen. By using the accompanying pen, a whiteboard will automatically appear and allow you to write directly on the screen. It is also possible to move text around and is perfect for collaboration at the office. The Hub also runs Skype for Business, allowing massive conference calls or international face-to-face meetings. Needless to say, this is one slick looking device and brings a very futuristic feel to your boring old conference room. With this event, Microsoft has successfully generated a lot of excitement for Windows 10 while helping users forget about Windows 8 and creating a renewed faith in the company’s ability to create top-quality operating systems. Windows 10 is set to launch by the end of the year and will be free to users of both Windows 7 and Windows 8 for exactly one year.